How to play Spotify music on Apple Watch without iPhone? Spotify is officially available on Apple Watch! Spotify officially released its Apple Watch app on Nov 13, 2018. 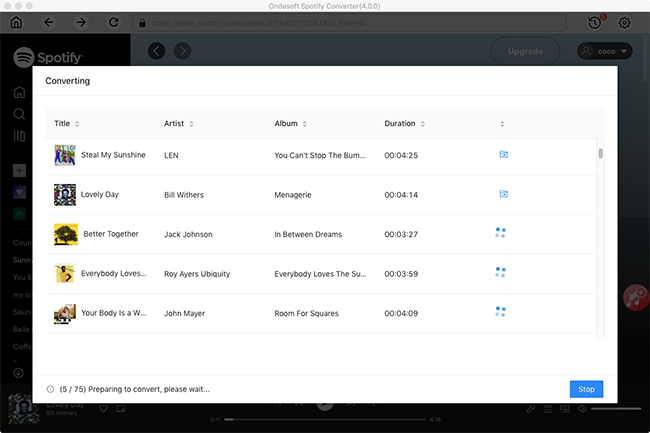 With this new app, users can enjoy an improved experience with better control and the ability to seamlessly connect to your speakers or devices. Spotify’s first version includes the ability to play, pause and rewind music on the Apple Watch, or control how music is played to compatible Spotify Connect devices. But one important feature is missing: you can't play the songs offline. The lack of offline playback may disappoint you. It means you can only enjoy Spotify songs on Apple Watch when there is internet connection. You still can't go for a run with just Bluetooth headphones and leave iPhone at home. 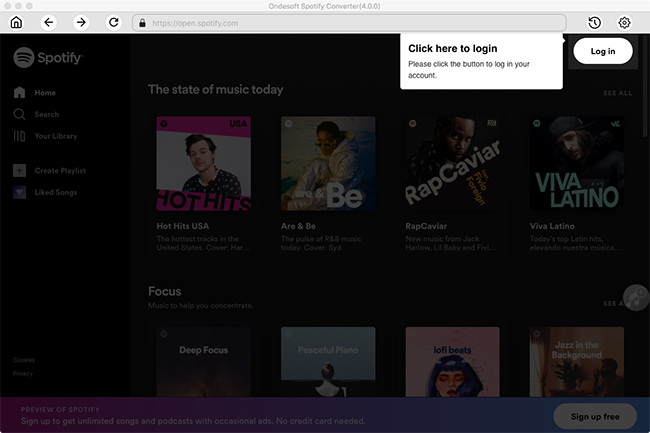 Spotify is promising that offline playback support is coming in the future. Browse for Spotify and install it to your Apple Watch. If you want to play Spotify music on Apple Watch offline now, here is a solution. Apple Watch allows your to add up to 2GB of local music directly. So you can add downloaded Spotify to your Apple Watch to listen them offline without a iPhone nearby. However, Spotify music are protected by DRM, only Premium users can download and save Spotify songs offline. But all users are not allowed to play downloaded Spotify music outside Spotify app. So if you want to sync Spotify music to Apple Watch, first you need to remove the DRM from Spotify music and convert Spotify music to plain MP3 format. 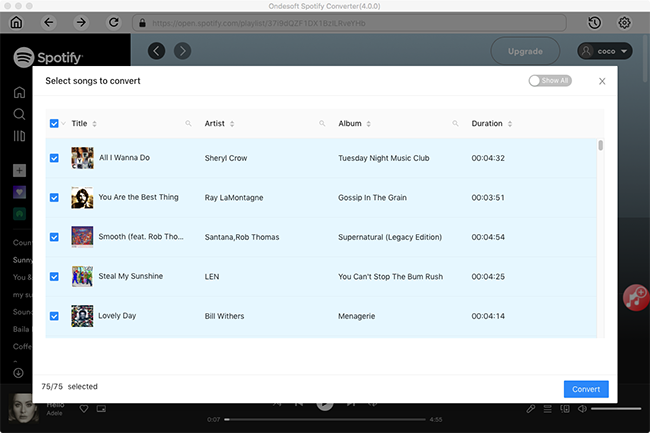 Then you need Ondesoft Spotify Music Converter . 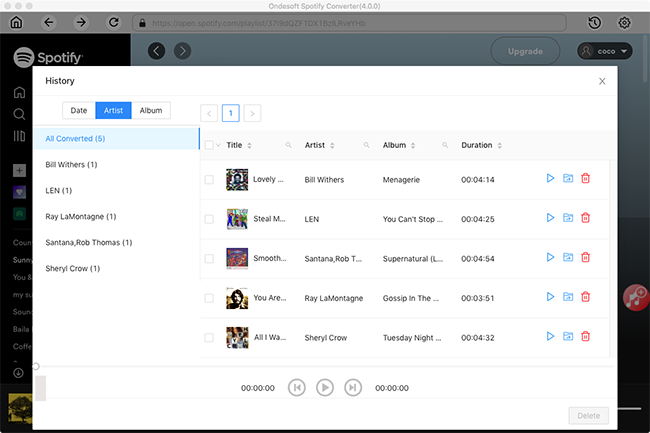 It's an excellent Spotify music downloader and converter, which is able to strip DRM from Spotify music and convert Spotify to MP3, M4A, FLAC or WAV with 100% original quality. With Ondesoft Spotify Converter, you are allowed to leave your iPhone at home, then go out and exercise while listening to your offline Spotify music on Apple Watch. Follow the detailed tutorial as below to learn how to download MP3 music from Spotify and play Spotify music on Apple Watch. 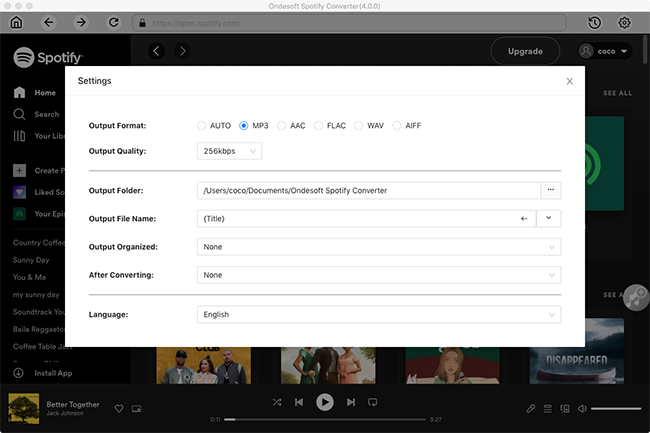 Download, install and run Ondesoft Spotify Converter. Please make sure you have installed Spotify app on your computer. 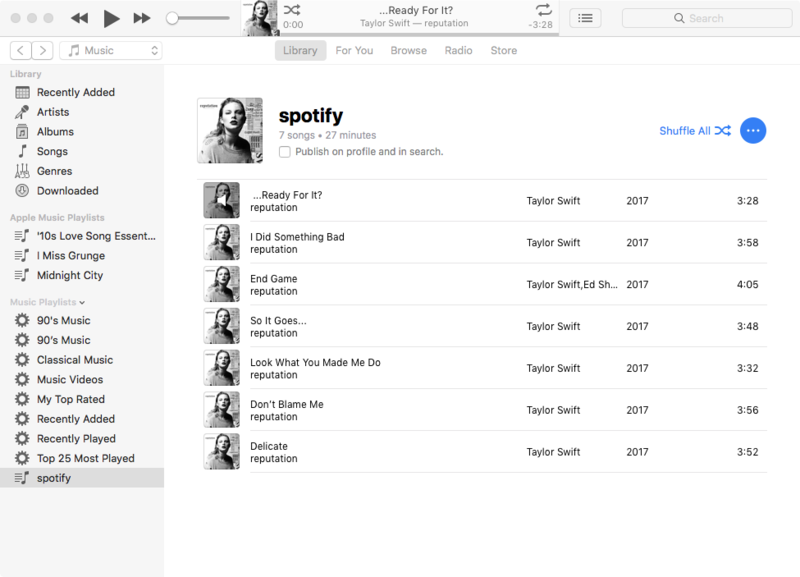 Then click the Add Files button, you will see a new window which indicates you to drag songs, playlists or albums from Spotify app to the program. Or you can copy and paste the relevant link from Spotify web player to the search box. Click the Add button to finish adding songs. When finish the above settings, click the Convert button to start the conversion. After the conversion, click the History button to locate the DRM-free Spotify songs. Add the converted Spotify songs to your iTunes library and then create a playlist for them. Turn on iCloud Music Library and your entire iTunes library will also appear on your iPhone. Add the converted Spotify songs to your Apple Watch by syncing them. After you sync, you can play the Spotify music on your Apple Watch without your iPhone. 1. Set your Apple Watch on its charger and make sure that the device is charging. 2. On your iPhone, go to Settings > Bluetooth. Make sure that Bluetooth is turned on. 3. On your iPhone, open the Apple Watch app, then tap the My Watch tab. 4. Tap Music > Add Add Music. 5. Choose the music that you want to sync. 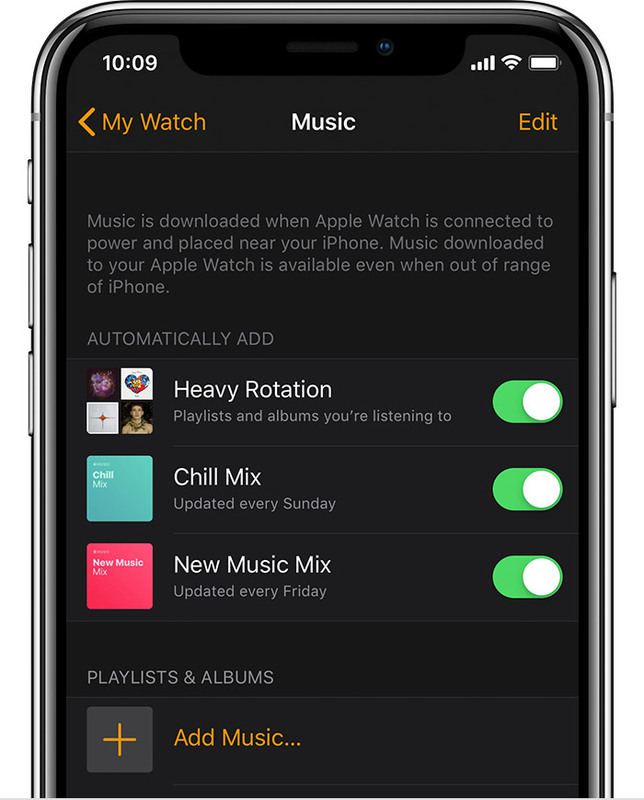 Once the converted Spotify playlist has synced to your Apple Watch and your headphones are paired with your watch, you can listen to the playlist on your Apple Watch without your iPhone. 1. On your Apple Watch, open the Music app. 2. Tap the Apple Watch icon to set it as the music source. 4. At the top you’ll see, On My Apple Watch. Select the playlist, press play and your music will begin!